NASA’s tennis court-size Juno probe is in a bit of a sticky situation 600 million miles from Earth. Just days before Juno swooped by Jupiter on Wednesday morning — its second 130,000 mph flyby since August 27 — the spacecraft experienced two significant glitches. 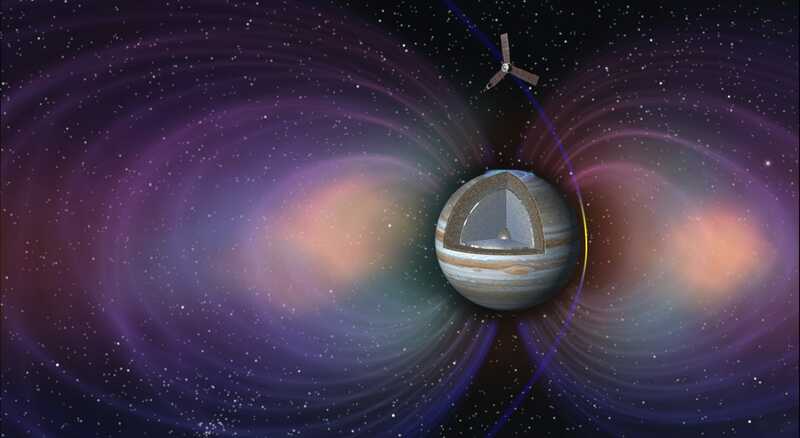 One of those problems prevented the $1.1 billion probe from taking new photos, recording auroras, and logging other crucial data about the gas giant, mission managers said during an American Astronomical Society (AAS) press briefing on Wednesday. The other could lengthen the planned mission from February 2018 (when it’s supposed to plunge into the clouds of Jupiter and die) by an additional one or two years. 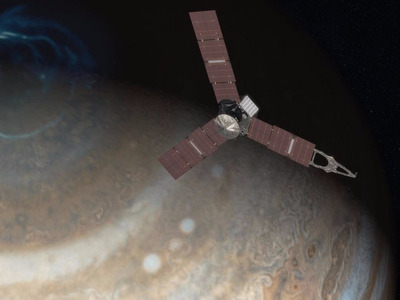 “On the way in [Tuesday] night, the spacecraft went into safe mode,” Scott Bolton, a planetary scientist at the Southwest Research Institute in San Antonio and the Juno mission’s leader, said during the AAS briefing. Fortunately, NASA said in an Oct. 19 press release, the probe is healthy and its Earth-based operators are working to restore Juno to a full functionality. What caused the spacecraft to reset itself? Bolton told Business Insider and other reporters who tuned into the conference that he wasn’t sure. “It’s too early to take a guess,” Bolton said, later adding: “My instinct is that it wasn’t caused by the intense radiation belts that we’re so fearful of,” since the glitch occurred some 13 hours from Juno’s closest approach to the cloud tops of Jupiter. Like an automobile on a blisteringly cold morning, Juno is having engine troubles, too. 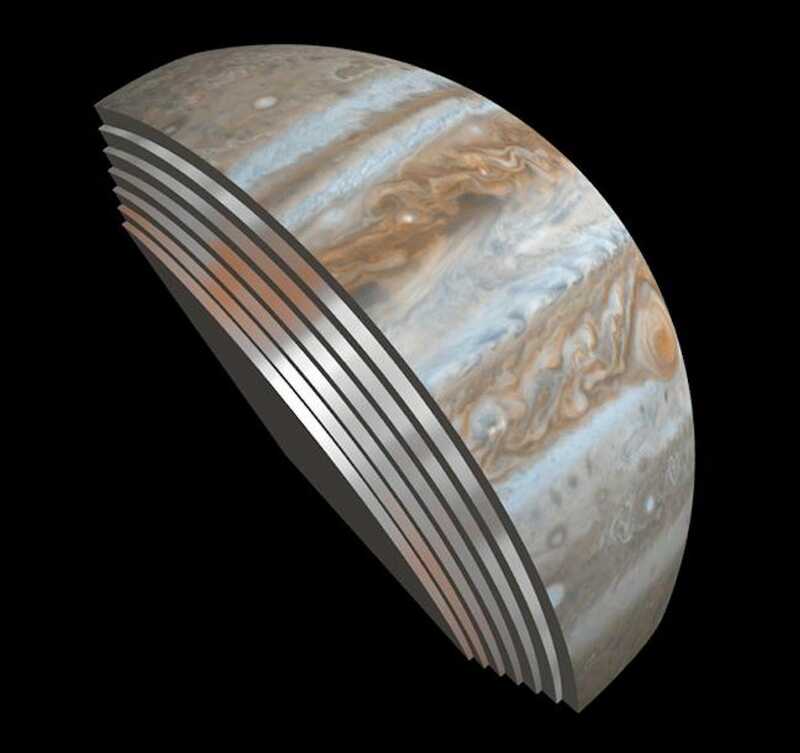 A firing of the probe’s main engine on October 19 was supposed to dramatically shorten Juno’s 53-day elliptical orbits around Jupiter to just 2 weeks — a move that would have sped of NASA’s study of Jupiter by nearly four-fold. However, during a routine test, the spacecraft’s operators noticed a problem: Two valves that pressurize the engine before firing were operating sluggishly, Bolton told reporters on Wednesday. “Maybe the valves were a little sticky,” he said. “We decided to postpone and delay that burn” to find the source of the problem, Bolton added. 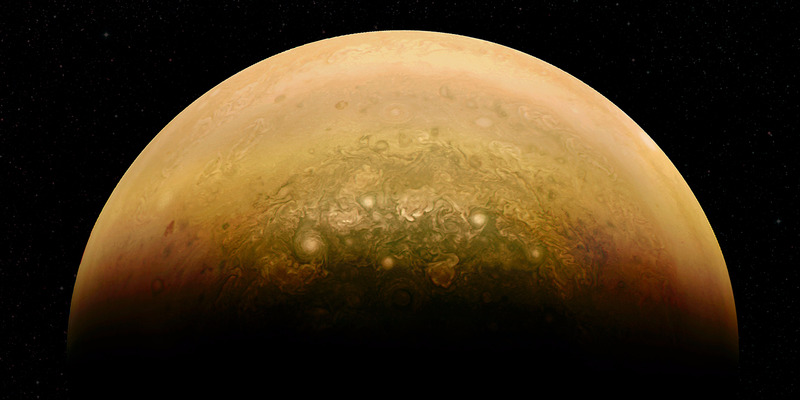 According to an Oct. 13 NASA press release about the issue, the next chance for Juno to fire its thruster will be Dec. 11 — right before its third perijove, or closest pass, of Jupiter. At worst, Bolton said the Juno team won’t ever fire the engine, and everyone will just have to be more patient. “But the science opportunities are all there,” he said. NASA/JPL-Caltech/SwRI/GSFCA peek under Jupiter’s clouds, as visualized from Juno spacecraft data. Aside from regaling reporters on Juno’s troubles, which seem recoverable, if not a little bit annoying, researchers took a moment to highlight new research from Juno’s first pass by the gas giant on August 27. 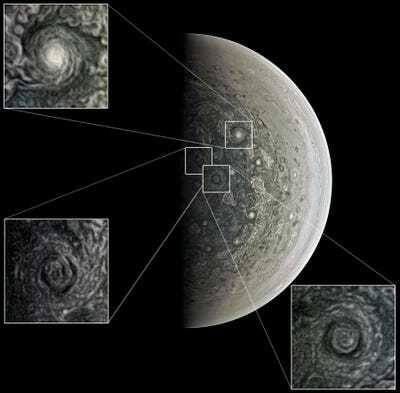 The above image is a visualisation of data gathered by Juno’s microwave radiometer, when is designed to “peel the layers back as if Jupiter is an onion,” Bolton said. He emphasised that this beyond-surface level view of Jupiter, let alone any gas giant, is unprecedented in the history of space exploration. 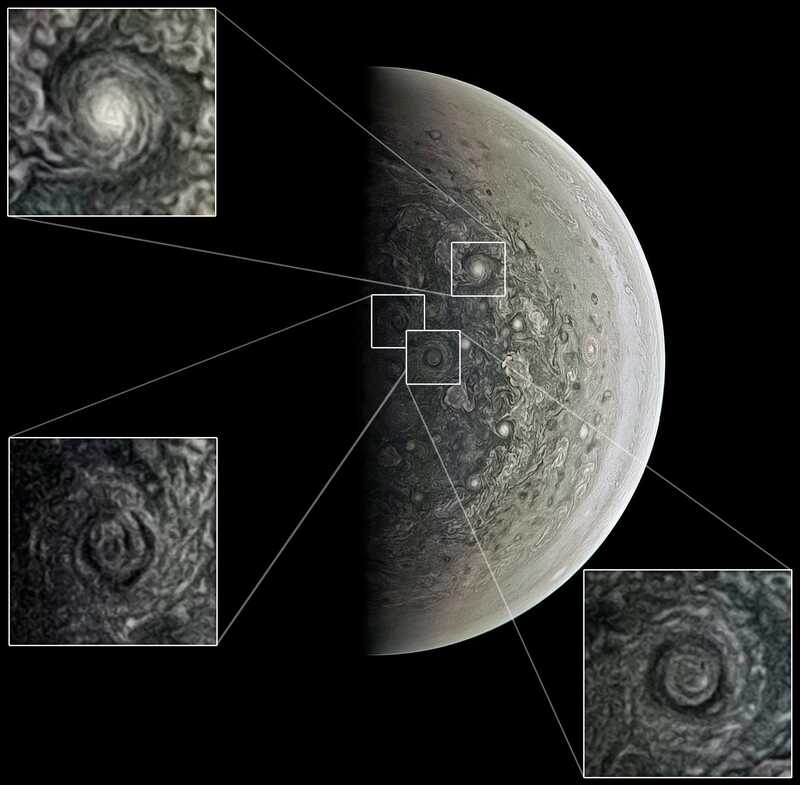 In addition to sharing the new image, Candice Hansen, an imaging scientist at the Planetary Science Institute in Tucson, Arizona, showed off a few Juno images that “citizen scientists” processed using raw data. 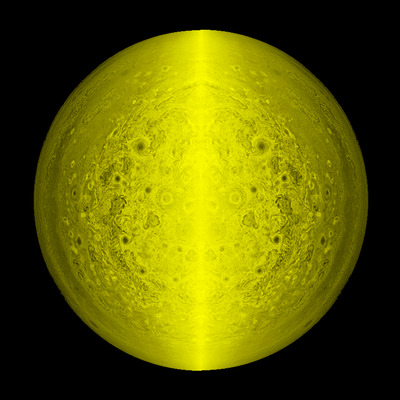 NASA/JPL-Caltech/SwRI/MSSS/Alex MaiA false-colour image of Jupiter’s North Pole. NASA/SwRI/MSSS/Roman TkachenkoEarth-size storms on Jupiter’s South Pole.